A few weeks ago i took my kids to see the movie frozen. We absolutely LOVED it. It is defintely not your typical Disney princess movie. Both of my kids, 12 year old boy and 7 year old girl enjoyed the movie immensely. i liked that it had two strong leading females, and unlike most Disney movies there was no Prince rescuing a princess. It was a wonderful movie about the importance of family, sisters and not being afraid to be your true self. After seeing the movie my girl began to sing the lyrics to the movie everyday. 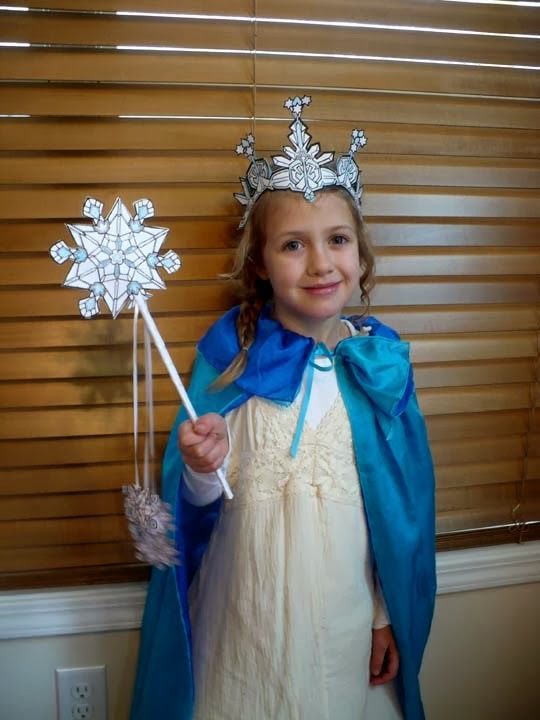 She told me she wanted an Elsa costume so we went to closet to see what we had that would work. She didn't have a light blue dress, but i found this off white sundress in my closet. 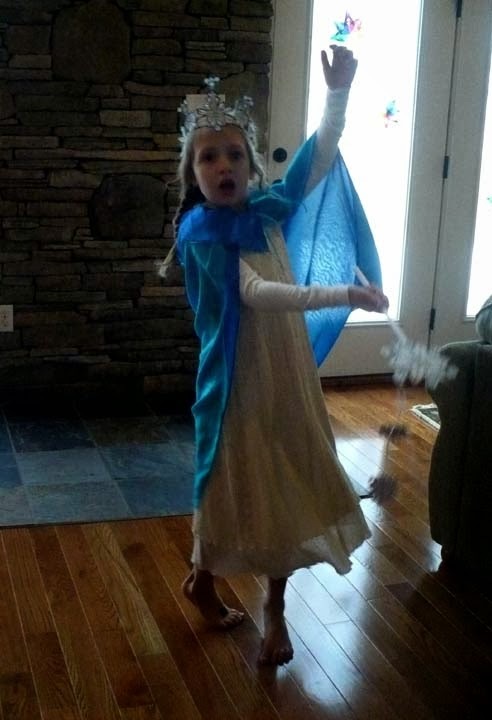 After tightening up the straps on it, it made the perfect Snow Queen dress. The we used a turquoise/blue cap from Sarah's Silks. We purchased ours from Imagine Childhood. We love Sarah's Silks they come in handy for all kinds of different dress up costumes. You could also easily use a regular blue or white play silk or even just a scarf or light fabric. All we needed now was a crown. i headed over to one of my favorite printable craft sites The Whimsical Realm of Phee Mc Faddell. 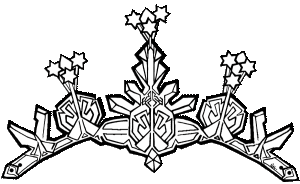 On the site you can find all kinds of free printable fantasy coloring pages, and craft projects. 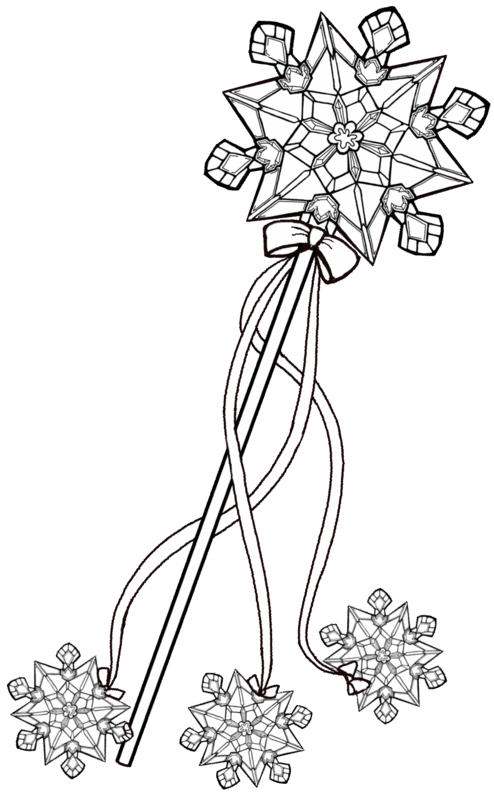 We printed up the snow flake fairies crown and wand on white cardstock. Then my daughter decorated them with blue colored pencils and gem stickers. Then my daughter decorated them with blue colored pencils and gem stickers. You'll also need some ribbon or yarn for the wand. Instead of a stick, i rolled a piece of paper around a pencil as tight as i could and then glue it in place and slide the pencil out and wrapped it in ribbon. There are directions for putting it all together in the Phee Mcfaddell site. You can use ribbon to tie on the crown, but my daughter wanted it to just set on top of her head so we made band out of cardstock and glued it together. 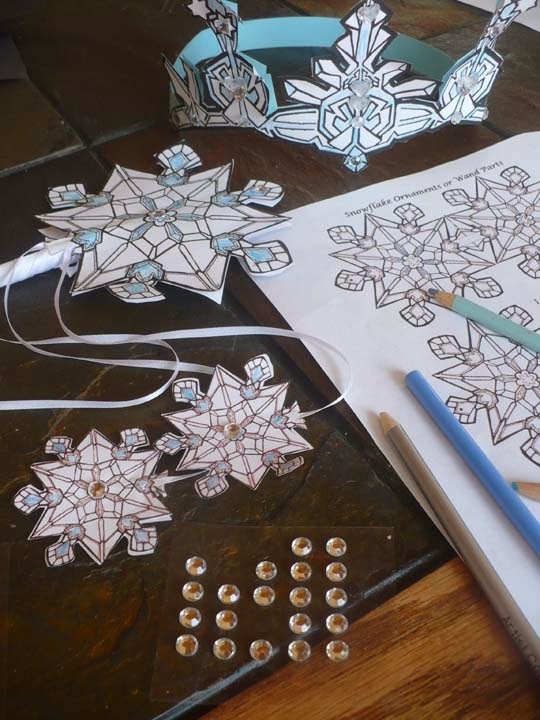 The hardest part of the project is cutting out all those snowflakes, which i ended doing. It's a still a great project for almost any age. My daughter was thrilled with the costume. She spent most of our snowed in week in costume, dancing and singing the songs from the movie. There are many other fantastic printable winter themed crafts over at Phee Mcfaddell, including icicle fairies, snow fairies, ice princess and winter sprites and more. Be sure to check the coloring pages and the Puppet crafts. Have fun exploring this fantastic site!